Jon Fitch has competing in the welterweight division of Bellator since March, 2018. He is a former PFL (formerly World Series of Fighting) Welterweight Champion, and also formerly competed for the Ultimate Fighting Championship where he compiled a record of 14–3–1 and challenged for the welterweight title. Fitch also formerly competed in the UFC, and during his tenure in the UFC was considered a top contender for the Welterweight championship. Fitch received a title shot against the UFC Welterweight champion, Georges St-Pierre, on August 9, 2008. After graduating from Carroll High School in Fort Wayne, Indiana, Fitch enrolled in at Purdue University in 1997 and graduated in 2002 with a bachelor's in physical education. As a walk-on to the Purdue wrestling team, Fitch wrestled under the tutelage of Tom Erikson and eventually became the team captain. Fitch finished with a 45-51 record overall for his collegiate wrestling career. 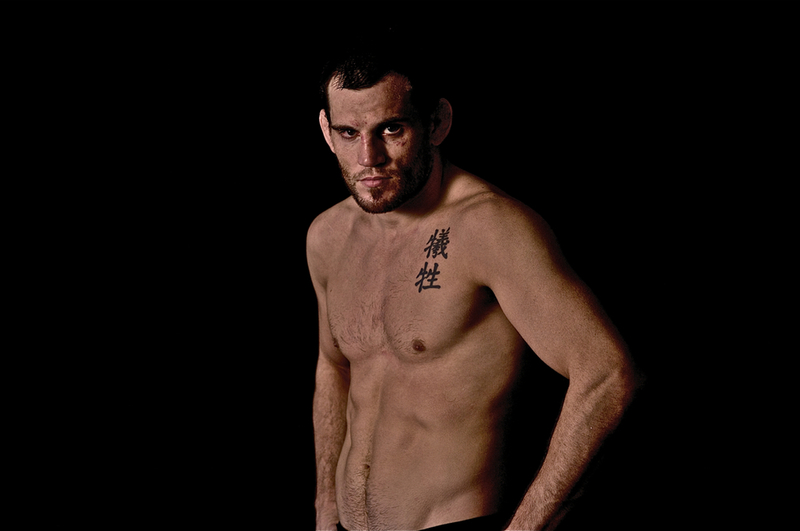 Jon Fitch began his MMA career at light heavyweight amassing a record of four wins, two losses and one no contest in his first seven fights. In his next seven fights, Fitch fought at Middleweight and had notable wins over fighters including Shonie Carter, Alex Serdyukov and Jeff Joslin. After failing to make the selection process for the first season of The Ultimate Fighter, Fitch earned a shot in the UFC in October, 2005, where Fitch defeated Brock Larson by unanimous decision. Soon after, Fitch dropped down to the welterweight division and won his next seven fights with victories over Josh Burkman, Thiago Alves, Luigi Fioravanti, Diego Sanchez, and Chris Wilson. Fitch fought for the UFC Welterweight title, but was defeated by Georges St. Pierre via unanimous decision at UFC 87. Had Fitch beaten St-Pierre he would have had a nine fight winning streak in the UFC, surpassing Royce Gracie's streak of eight straight wins (a record that has since been broken by Anderson Silva, whose winning streak ended at 16 on July 6, 2013). The loss also snapped Fitch's 16 fight winning streak, both in and out of the UFC. Fitch was released from the UFC on the November 20, 2008. The dispute was over his reluctance to sign a lifetime contract to allow his name and likeness to be used in a video game the UFC released with THQ. In the end, Fitch ended up signing a licensing agreement that will allow the UFC to feature him in their UFC Undisputed video game release and returned to the UFC. Fitch's exile from the UFC lasted less than 24 hours. Fitch dominated Pride Fighting Championships veteran Akihiro Gono en route to a unanimous decision victory at UFC 94. Fitch next defeated formerly unbeaten Brazilian Paulo Thiago via unanimous decision at UFC 100. Fitch fought Mike Pierce in December, 2009, at UFC 107 winning via unanimous decision. Fitch fought Ben Saunders in March 2010 at UFC 111 and won the fight via unanimous decision. Fitch fought a rematch against Thiago Alves at UFC 117. Alves failed to make weight, weighing in at 171.5 lbs, meaning he had to give up 20% of his fight purse. Fitch went on to defeat Alves via unanimous decision. Fitch fought against B.J. Penn at UFC 127 in Australia, the fight was declared a majority draw. Fitch fought Johny Hendricks in December, 2011, at UFC 141. He was knocked out 12 seconds into the fight. Fitch defeated rising prospect Erick Silva via unanimous decision in October, 2012, at UFC 153, with the back-and-forth bout receiving Fight of the Night honors. Fitch next faced Demian Maia in February, 2013, at UFC 156. Fitch lost by unanimous decision and was subsequently released from the promotion, despite being a top 10 ranked welterweight and having a 14-3-1 record with the promotion overall. Fitch's release from the promotion caused much debate about the UFC "code of conduct" and the general "skill-demand" in UFC, as most commentators had not expected a single loss to lead to a release from the promotion. On March 7, 2013, it was announced that Fitch signed a four-fight contract with World Series of Fighting. He made his promotional debut in June, 2013, at WSOF 3, in a rematch against Josh Burkman. Fitch was knocked down by a punch and then finished by Burkman due to a guillotine choke submission. Burkman became the second man to defeat Fitch by a submission, the first being Mike Pyle. Fitch faced Marcelo Alfaya at WSOF 6 on October, 2013, winning via split decision. Fitch defeated John Hallman at WSOF 11 on July 5, 2014 by unanimous decision. Fitch faced Rousimir Palhares at WSOF 16 for the welterweight championship on December 13, 2014. Fitch lost by kneebar in the first round. Fitch returned to the promotion on October 17, 2015 at WSOF 24. He faced Yushin Okami in the main event for the chance to fight for the vacant Welterweight title. Fitch won the bout by unanimous decision. Fitch was lined up to face Jake Shields for the vacant WSOF welterweight championship at WSOF 30 on April 1, 2016. Though they have never competed together in an MMA contest, Shields holds a victory over Fitch in a submission grappling match. However, the match was later cancelled due to contract issues between Shields and the company. Fitch went on to face João Zeferino for the vacant WSOF Welterweight Championship. He won via unanimous decision. On September 13, 2016, it was announced that Fitch would defend the WSOF Welterweight Championship against Jake Shields on November 12, 2016 at WSOF 34. On October 17, 2016, it was announced that the fight was then rescheduled to take place on December 31, 2016 in the co-main event. Fitch won the fight via unanimous decision. In his second title defense for the now renamed league, Fitch faced Brian Foster on June 30, 2017 at Professional Fighters League 1, He won the fight in the second round due to submission, his first finish in ten years. Fitch was signed by Bellator MMA, vacating his WSOF Welterweight title, on March 1, 2018. Fitch made his promotional debut against Paul Daley at Bellator 199 on May 12, 2018. He won the fight by unanimous decision. Fitch is expected to challenge Rory MacDonald in a welterweight title fight that is simultaneously the first round of Bellator Welterweight Grand Prix at Bellator 220 on April 27, 2019.